In the eastern predawn sky from 1:30 am to dawn on Thursday, Dec. 22, the waning crescent moon will sit less than 5 degrees west of (above) Jupiter. Both bright objects will be easy to see with naked eyes. The following morning, the moon will be 7.5 degrees below Jupiter. If you're up late tonight — or rather, during the pre-dawn hours of Thursday (Dec. 22) — two objects will likely catch your eye if the sky is clear. The first will be the moon in a waning, crescent phase, with 36 percent of its face illuminated by sunlight. The moon will emerge from above the eastern horizon at around 12:55 a.m. in your local time. About a half hour after moonrise, the brightly shining planet Jupiter will rise into the sky roughly 5 degrees below the moon. To put that in perspective, your clenched fist measures about 10 degrees across at arm's length, so the moon and Jupiter will appear close, separated by roughly one-third of the width of your fist. About another hour later, just 5 degrees below Jupiter and slightly to the right, the bluish binary star Spica will rise in the zodiacal constellation of Virgo. The view of these three objects so close together in the night sky, of course, comes merely due to an illusion of perspective: The moon is about 249,500 miles (401,500 kilometers) from Earth, while Jupiter is actually 529 million miles (852 million km) away, more than 2,000 times farther out in space compared to the moon. And Spica lies 250 light-years or about 1,450 trillionmiles (2,300 trillion km) out in space. Jupiter shines nearly twice as bright as Sirius, the brightest star in the night sky. Whenever Jupiter is above the horizon, the gas giant — the solar system's biggest planet, at 88,800 miles (143,000 km) in diameter — attracts immediate attention. To the eye, Jupiter resembles a brilliant, silvery-white, non-twinkling star. On April 7, 2017, the gas giant will arrive at opposition, meaning it will be directly opposite the sun in Earth's sky, rising at sunset and setting at sunrise. As a result, Jupiter will be visible all night. Even without the close proximity of the moon, you can find Jupiter glimmering balefully above the horizon, about 10 degrees south of due east shortly after 1:30 a.m. local standard time. But Jupiter will not reach an altitude of 30 degrees above the southeast horizon, or one-third of the way up in the sky, until 4:25 a.m. Some skywatchers consider that altitude to be the dividing line between objects that are "low" versus those that are "well-placed" in the sky. Sharp telescopic views are seldom possible until an object reaches an altitude of at least 30 degrees, given the haziness and turbulence of Earth’s atmosphere. Three moons … or four? 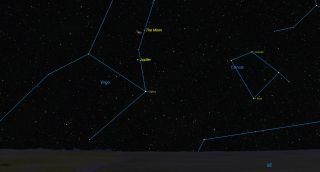 The four Galilean moons also provide an upcoming skywatching attraction. These four satellites of Jupiter were first seen by Galileo using his crude telescope in 1610. The satellites are fun to watch as they change their position relative to Jupiter from hour to hour and night to night. You can glimpse them through 7-power binoculars (if you hold the binoculars steady), or better yet, through a small telescope. Initially on Thursday morning, all four moons will be apparent: Io, Europa and Ganymede will be on one side of Jupiter, while Callisto will be on the opposite side, much farther away from Jupiter. Then, at 4:18 a.m. EST (0918 GMT), Io will disappear, being eclipsed by the shadow of Jupiter. This eclipse will not be visible out in the far west, because Jupiter will have not yet risen. By the time the gas giant does rise, only three moons will still be visible. But at 4:39 a.m. Pacific Time (1239 GMT), Io will emerge back into view, appearing to come out from behind Jupiter's disk. So, including Earth's own moon, and depending on when you look up, you'll have either four or five moons for the price of one! Joe Rao serves as an instructor and guest lecturer at New York's Hayden Planetarium. He writes about astronomy for Natural History magazine, the Farmer's Almanac and other publications, and he is also an on-camera meteorologist for News 12 Westchester, N.Y. Follow us on Twitter @Spacedotcom. We're also on Facebook & Google+. Original story on Space.com.